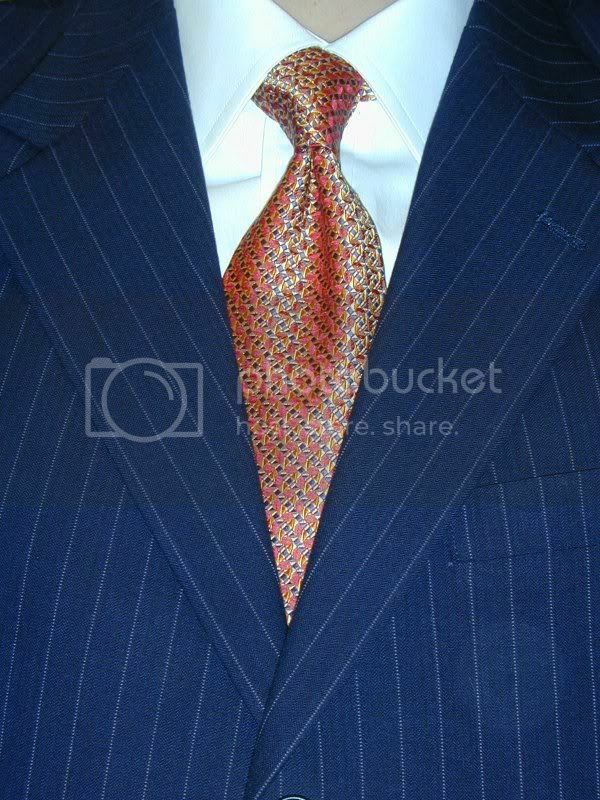 The good old standby blue pinstripe suit for today. The good old (actually, it's fairly new) spread collar white pinpoint dress shirt. The necktie, on the other hand is not so standby. Another Jos A. Bank Signature, but with more variation in color than most of the others I own. It's fairly difficult to describe because there really are quite a few things going on -- red ovals, back to back gold and orange triangles, back to back orange and navy triangles and, finally, navy squares. It's such a busy tie that I was nearly afraid to try anything but a plain, white dress shirt. Some people don't like blue suits because they think it's so gay but for me I admire blue pinstripe suit and I love to collect them. Questions is, what color shoes and belt did you wear with the suit? brown? black? grey?